Order inexpensive blueprints for one, two, three and four-car detached garages, classic carriage houses, car barns, workshops, big, practical pole-frame garages, garages with lofts, expandable garages, workshops and instant download plans that you can print from your computer right now. 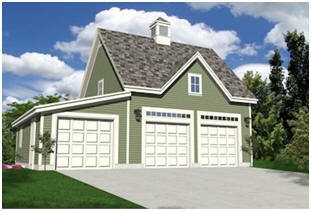 Country Garage Plans Build a garage that is just as economical as a pole-barn. These country garage blueprints are planned for economy and flexibility. 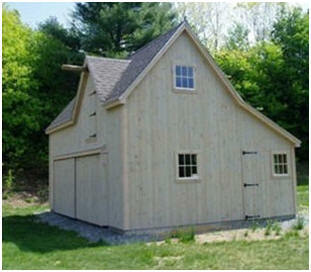 They all have lofts for inexpensive extra space and are all designed for practical post-frame (pole barn) construction. Select from one, two, three or four car garage layouts, garages with attached carports or garages with extra areas for your garden tractor, hobbies or workshop. Carriage House Plans Build a big three-car or four-car garage with the style of a traditional carriage house and a big loft for storage space or for your use as a studio or home office. 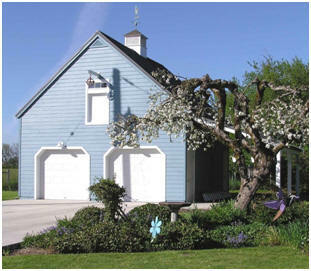 These blueprints are for either conventional stud-frame construction or economical post-frame (pole-barn) construction. Instant Download Garage Plans Get started on your new garage or country car barn right now. With one order for just $29.00 you can download construction blueprints for all of the designs that you'll find on this page. You'll have a choice of one, two, three or four-car garages, barn and carriage house style garages, garages with lofts and workshop garages. 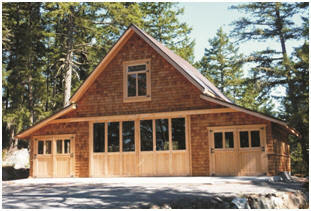 Workshop Plans Build a woodshop, auto repair garage, hobby shop, craft barn, studio or home office in your backyard. These inexpensive, flexible plans will help you have a free-standing building or a combination workshop and garage. 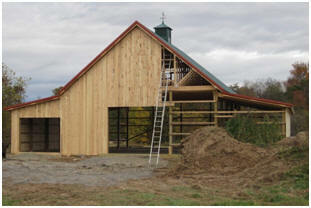 The blueprints are for either conventional stud-frame construction or economical post-frame (pole-barn) construction. Barn Plans Order practical barn blueprints, car barn plans with lofts and optional add-on garages, carports, storage spaces, greenhouses and workshop areas, horse barn plans, workshop designs and plans for small barns, hobby shops, backyard studios and small animal shelters. Choose from all types of pole-barns, mini-barns and sheds.